Almost two decades after the building closed, downtown Dallas landmark, the Statler Hotel, is back in business. Developers spent three years and $230 million saving the building, which has been turned into a luxury Hilton Curio Hotel, part of the Waldorf Astoria Collection. One of Dallas' grand mid-century buildings, the 19-story hotel that once entertained movie stars and presidents had fallen on hard times when it closed in 2001. The property made the preservationists' list of the most endangered landmarks in Dallas. In 2014, Centurion American Development Group bought the Statler and, backed with almost $50 million in financial incentives from the city, began the renovation. 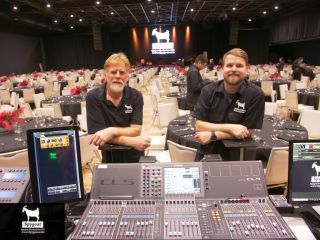 Included as part of the audio renovation are two Statler-owned Yamaha CL5 Digital Audio Consoles and Rio 3224-D and 1608-D input/output boxes. For the hotel’s grand reopening, which took place in January 2018, the Statler’s preferred performing arts AV vendor and projection management company, Spygoat Productions of Wyle, TX, provided a NEXO GEO S1210 line array rental through OnCue Productions of Carrollton, TX. The three day celebration included performances by The Rat Pack Is Back cover band on the first night, jazz musician Morganne Picard on night two, and ending with a special performance by crooner Tony Bennett on the third night. Bennett performed at the Statler when it initially opened 30 years ago. The NEXO rig for the reopening celebration consisted of 14 GEO S1210 mains with NXAmp 4x4 (provided by OnCue), 4 NEXO PS10s for front and side fills, a PS10 with PS10 amp, and 12 PS15s with NXAmp 4x4s, all provided by Spygoat.